That’s a tall order, so I’m going to separate it into two parts. Today we’ll break down all the types of coverage. But first, we need to clarify one legal definition. Collision means that your car hits, or is hit by, another vehicle, person, or object. So there must be contact between your car and something or someone else — another car, a pedestrian, a bicycle, a fire hydrant, a plate glass window, etc. Even a pothole is considered an inanimate object for collision purposes. One exception: hitting an animal is, strangely, not considered a collision. 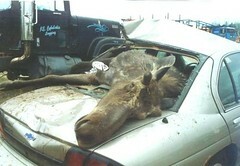 So when a moose crashes through your windshield, don’t count on collision insurance. Animal-based damage falls under ‘comprehensive’, just like hail and tornado damage. When you get an insurance quote, you’ll see up to eight different types of coverage: four primary types and up to four extras. Bodily Injury covers medical and funeral costs and compensation for lost wages, pain, and suffering. Property Damage covers the repair or replacement cost of cars and of buildings or other stationary objects. Example: if your liability coverage is 25/50/10 and you hit another car containing three people, your policy will pay for up to $10K in damage to the other car, and up to $25K in injury costs for any particular passenger, but no more than $50K of injury (medical, funeral, etc.) costs in total. UM/UIM Coverage is divided into Bodily Injury and Property Damage exactly the same way that Liability Coverage is, and uses the same three-number shorthand. (In some cases there may be only two numbers for Bodily Injury, and Property Damage is not included.) UM/UIM Coverage kicks in after the at-fault driver’s insurance, if any, is exhausted. Next, we’ll cover which insurance to buy and how much, and which offers you should ignore. Did I miss anything? Ever seen car insurance of a sort not listed here? Are all the definitions clear? Aww. I know, it’s kind of daunting — that’s part of why I’m writing these articles. But you actually do want to know … because not knowing means a) wasting a lot of money, b) leaving yourself open to financial ruin, or c) both. I just posted the second half of the primer — it’s long, but I tried really hard to make it comprehensible. I hope it helps! Why is a shopping cart ding estimated damages at $750.00 considered to be a collision with an applied $250.00 deductible compared to a comprehensive issue? Car is parked, no one is in the car, the car is 50-ft from the nearest car or shopping car storage rack. State Farms interprets this as a collision. This article is excellent but I see that you aren’t using the full monetizing potential of your page.